ALBANY, NY--(Marketwired - Jun 11, 2013) - Associates at the TownePlace Suites Albany Downtown/Medical Center are used to helping out. Each day at this extended-stay hotel in Albany, they dedicate their effort into ensuring guests have the most comfortable stay possible. So when it came to deciding to participate in Habitat for Humanity, there was no question: They were ready to chip in. 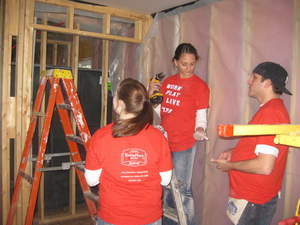 On April 12th, 17 employees of this pet-friendly hotel approximately 15 minutes away from the airport made their way to 67 Delaware St. in downtown Albany, where they spent the day building a home for a local family in need. "This was an exciting kick-off to our Habitat for Humanity campaign," Jake Hendrickson, sales manager at this hotel near St. Peters Hospital said. "We had an excellent turn out, did a lot of work and had a great time doing it. I was very proud to be part of our TPS community action team and am looking forward, with great anticipation, to our next event. We appreciate everyone at our local Habitat for Humanity chapter that helped organize our group and made us as useful and productive as we could have been." Since it was founded in 1976, Habitat for Humanity has helped build or repair more than 600,000 homes and helped more than 3 million people worldwide. To learn more, visit www.habitat.org/. Being on the road for an extended period of time can be hard, but at the Marriott TownePlace Suites Albany Downtown/Medical Center, guests can settle in as if they never left home. With spacious suites, a 24-hour staff, a convenient location and thoughtful amenities, this downtown Albany hotel is the perfect choice for those visiting the area's premier medical facilities, professional colleges or downtown businesses. Pet-friendly studio, one and two-bedroom suites range from 420 to 700 square feet, providing ample space for work and relaxation. Fully furnished apartments feature a desk, 32-inch LCD TV, complimentary high-speed Internet access and a fully equipped kitchen with stove top, microwave, dishwasher and refrigerator. Long-term rates are available for corporate housing, and daily housekeeping ensures guests return to a clean room after a long day of work. Stay on track of fitness goals with an indoor heated pool, 24-hour fitness center and complimentary breakfast offering healthy, hearty choices. Save with complimentary parking and local shuttle service. For guest convenience, laundry facilities and In-A-Pinch market are available. Located near Empire State Plaza Convention Center, Albany International Airport, Times Union Center, NY State Museum and Albany Law School, this hotel is ideal for hosting small events; its meeting room can accommodate up to 15-18 guests comfortably.